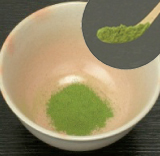 If you use sieve to sift the Maccha powder, it makes it easier to create smooth foam. 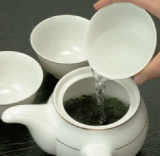 Pour one third (70~80cc) of the hot water with a temperature of around 80 degrees C.
With the opposite of your dominant hand, hold the teacup firmly. 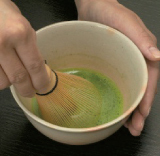 With the index, middle finger, and thumb of your dominant hand, hold the tea whisk’s bamboo handle. At first, mix the tea powder very gently in the water, then in a repeating motion, move your wrist back and forth to mix it well. 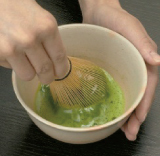 At the end, move the tea whisk elegantly to smooth out the surface of the tea and then take the whisk out very slowly. 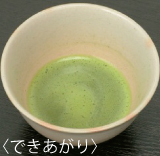 It is done when the surface of the tea is covered with very creamy foam. 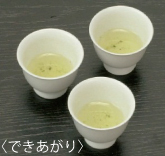 Divide 180cc of boiled water into three cups (60cc in each) and cool to 70 to 80 degrees C. (If you want to speed this process up, you can use different cups or mugs than the ones use to make Gyokuro. 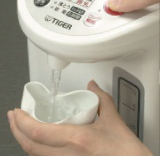 Water temperature cools 5 to 10 degrees C each time it is moved to a different vessel. 60cc of water are needed for each person. 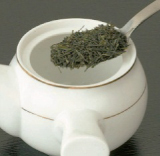 Add 2 tablespoons full of tea leaves, about 10g to the tea pot. ＊Use 5g of tea leaves per person. Pour in the water cooled to about 70 to 80 degrees C into the pot. Put on the lid and wait for the tea to brew. The tea leaves will turn soft and light green. It will be ready in seconds to 1 minute. 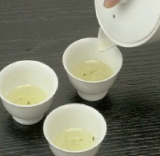 Pour the tea little by little into each cup so that the flavor of the tea will be even (the same as with Gyokuro). It’s important to pour to the last drop. After the first brew, re-brew with hotter water and wait for less time, and make sure to pour to the last drop every time. 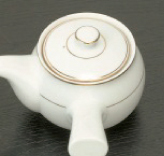 Pour about 60 to 70cc of boiled water from a cup into a teapot. Transfer that water to the teacup and cool it to from 40(close to body temperature) to 60 degrees C.
＊20 to 30cc of water are needed for each person. Pour in the water cooled to from about 40 (close to body temperature) to 60 degrees C.
Keep the lid off and observe how tea leaves travel in the water. ＊You can put the lid on and brew like regular tea as well. 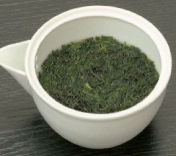 The tea leaves turn soft and light green after about 1 minute or so, and it will be ready to drink in 1 to 2 minutes. 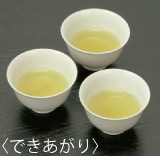 Pour the tea little by little into each cup so that the flavor of tea will be an even flavor in every cup. 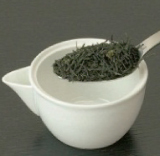 After the first brew, you can reuse the same tea leaves, but use hotter water and wait for less time. 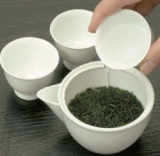 You can brew tea at least three times with the same tea leaves. 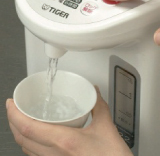 Use “soft” water and boil it in a kettle, allow to sit for 3 to 5 minutes to remove any chlorine smell. 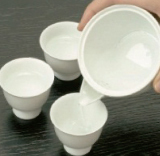 Using lower temperature water can bring out more amino acid (Umami taste) which makes tea taste better and prevents the tea to becoming too astringent or bitter. It’s hard to regulate the amount of tea needed to fit every one’s taste so try several times to find your own perfect amount. The lower the water temperature, the longer the tea to takes brew and turn light green. It’s important to pour to the last drop in order to make tea well after the first brew. 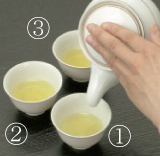 Order the cups 1, 2, 3 and pour in the tea little by little in that order 1, 2, 3. Once you finish pouring a little into cup No.3, pour the tea again little by little but in reverse order 3, 2, 1. Then repeat the order 1, 2, 3,3,2,1, until all the cups are full.